Sorry... the 2017 Lexus RX 350 is no longer being sold as new. Instead, take the first step to a great deal on 2019 Lexus RX 350 with a free price quote! 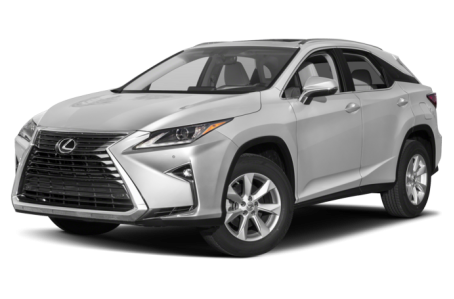 The 2017 Lexus RX 350 is the fourth-generation of the luxurious, elegant midsize crossover. It competes with the Acura MDX, Infiniti QX60, and Audi Q5. The RX 450h is the more fuel efficient hybrid version, which will be covered in a separate overview. Two trim levels are available: the base RX 350 and RX 350 F Sport. In the looks department, the RX is a head-turner with its muscular forms, blacked-out C-pillars, and dynamic L-shaped lines, which can be seen prominently at almost every angle. Standard features include power/heated side mirrors with turn signal indicators, a power liftgate, a dual pipe exhaust system, and all LED lighting for the headlights, fog lamps, and daytime running lights. Color-customizable 20-inch wheels are available as well. The F Sport trim includes exterior badging, a mesh grille, a front spoiler, a rear valance, and 20-inch dark graphite alloy wheels. The RX 350 is powered a standard 295-hp, 3.5-liter V-6 engine mated to an 8-speed automatic transmission and front-wheel drive (FWD). All-wheel drive is also available. Fuel efficiency for FWD models is an EPA-estimated 20/27 mpg city/highway. It slightly lowers to a 19/26 mpg rating for AWD models. Inside, the 5-passenger RX 350 is crafted with a variety of premium materials, featuring a leather-trimmed steering wheel and shift knob as well as contrast stitching for the center console. The center stack features a standard multimedia system that includes an 8-inch screen, Bluetooth connectivity for phone and audio, and a USB port. It can be upgraded with a 12.3-inch widescreen display with touchpad control, a new Scout GPS Link navigation system, a Mark Levinson premium audio system, and the Lexus Enform App Suite system for emergencies, security, vehicle access, and diagnostics. Standard features include dual-zone automatic climate control, a power tilt/telescoping steering wheel, and a 60/40-split power-folding second row seat. Leather upholstery, a head-up information display, heated/ventilated front seats, heated rear seats, a dual-screen rear-seat entertainment system, and a panoramic moonroof are also available. The Safety System Plus Package now comes standard. It is a suite of active safety features which can help avoid or mitigate collisions across a range of vehicle speeds under certain conditions. It integrates several safety systems including a pre-collision system that detects sudden stops and engages automatic braking, adaptive cruise control, lane departure warning, and an automatic high-beam system. Other available safety features include a blindspot monitoring system and rear cross-traffic alert. The F Sport trim also has an integrated vehicle control software system, adaptive variable suspension, sport-tuned power steering, and rain-sensing wipers. 77 of 85 (90%) consumers said they would recommend this vehicle to a friend.